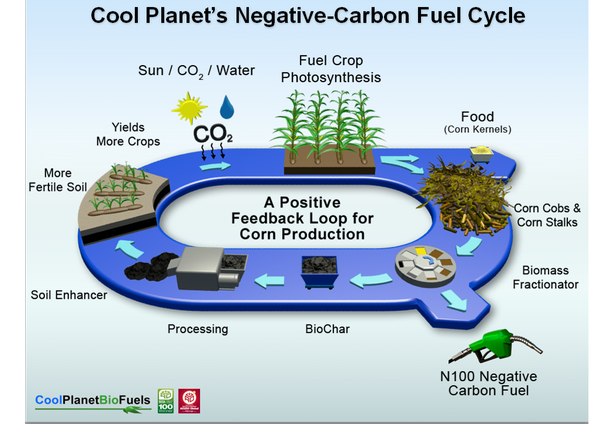 A technology is described that simultaneously reverses global warming and improves the standard of living of the poor via the creation of transportation fuels from the thermo-chemical breakdown of biomass. The technology selectively pyrolyzes biomass in special reactors, converts organic fragments to gasoline and diesel components, and treats the remnant char to make it usable as a soil amendment. This technology will empower impoverished individuals to join the global economy while providing a means to feed themselves. This is an excellent approach, which addresses a lot of points that have been overlooked by the mainstream alternative energy community. Putting part of the captured biomass back into the soil to improve soil fertility is the opposite of what the mainstream has been promoting. Keeping the production unit small to decrease transportation costs and inefficiencies is also essential. The forecast for how little land it takes to produce all the fuel needed for transportation and reversing climate change seems too optimistic but I haven't done the math. However, the concept that by improving soil as you produce fuel, you can increase future productivity is sound. I like the logical approach from the big picture down. Good luck.